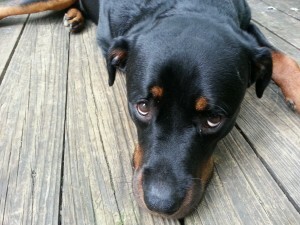 Chico is a two year old rotti. He has always been a very energetic and loving dog. I got Chico a week after my mother-in-law passed. He helped a lot with the grieving process. When my wife and I separated, Chico was all that I had. He has kept me whole. He was diagnosed in late July with Leukemia. They told me he had only a 10% chance of living 6 months because his white cell count was so high. After only 5 treatments, Chico is in remission. He is getting back to himself every day. We are not out of the woods yet though, he still requires more treatments to keep him in remission.